Red, single, midseason, 4' tall, lutea hybrid. An almost translucent red with dark flares in the center and yellow carpel tips surrounded by yellow stamens. 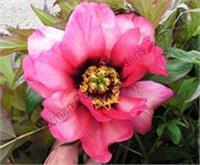 The flower color fades with maturity and blend well with the red-edged leaves.